A rare chance to sleep in wasn’t exploited as I woke at 7am ready for more coffee! Hopping in a taxi and handing my phone with Mike at the other end to the driver, we made our way to Moplaco’s Addis HQ and were greeted by office manager Girma. He took us through to the cupping lab where lab technician Hannah fired up the sample roaster, while her assistant Gante helped me set up the bowls for cupping some coffee I brought with me. 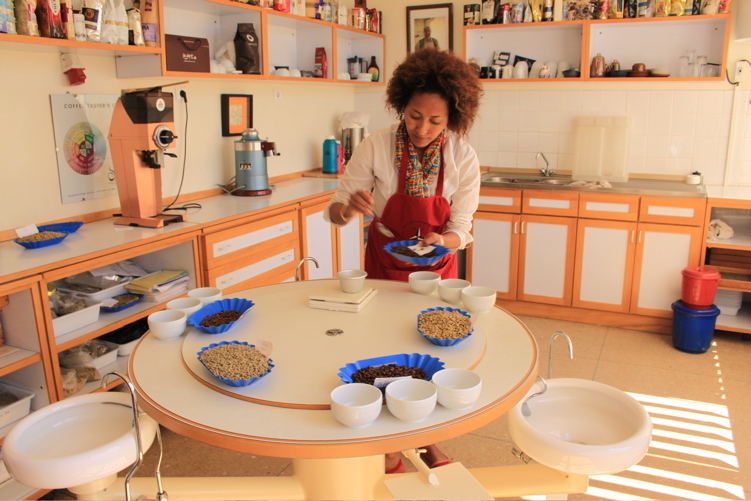 Hannah chose a Washed Yirga Cheffe PB for us to taste (peaberries and screen 13 down), I asked to try the Lekempti, and a couple of roasts later we had a table of El Salvador and Ethiopia to compare. The PB, even at the tail end of the crop, was classically Yirga Cheffe-ian in aroma and flavour, with bergamot, lime and spice, while the Lekempti sadly was a bit nutty, dry and popcorn-like. Hannah found the Kilimanjaro Pulped to be very citrusy and not so much to her liking, but really enjoyed the Natural with its fruit, berries and sweetness. Running a bit behind schedule we had a quick tour of their warehouse, a massive, pristinely clean, tidy and well organized space where coffee first goes through a rough sorting for metal, sticks and other foreign matter, a destoner, a polisher, density sorters and optical colour sorting before being passed on to the hand sorters. The colour sorter worked fast, each of the 18 lenses were currently set to check 3 kgs of beans per minute, blowing the off coloured ones out of the stream of beans with a precisely targeted jet of air. 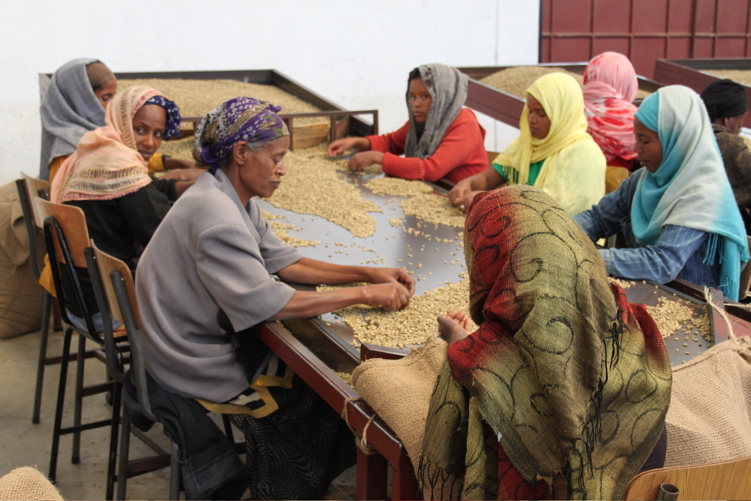 Still, a finishing round of hand sorting adds a human element to the process that can’t be underestimated, and this warehouse employs 350 women during peak for this last and final quality control. The second stop in the day was in many ways the core of what I came here to learn about, the auction rooms at the Ethiopian Commodity Exchange. On the outside of the building are mounted large screens which show the live update prices of the coffees that were being bought and sold inside. Trader Dagem Tadesse was on hand to guide us through the process, starting with getting us through security who were not too pleased to see my camera! Once allowed in, we took our seats behind the glass wall of the viewing room to watch the action on the floor. I did manage to sneak some (very bad) pictures of it all on my cellphone, so I might try to get that up here a bit later. 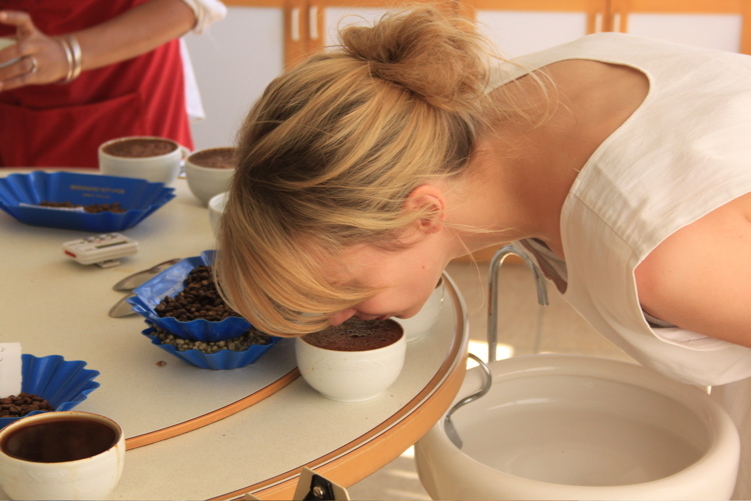 Even the lowest grades of coffees are traded at the ECX, but only sold for internal consumption. Any coffee staying for the local market is traded in the morning, while the export lots are traded between 2p and 5pm. They are handled by area, so the Limus all get processed in one round, then they do the Sidamos, then the Yirgacheffes and so on (not necessarily in that order). Due to it being Friday, many people had church that morning, when we arrived just after 2pm they were also doing some rescheduled internal coffee. So the scene of the ECX is an octagonal sunken floor with large screens on the wall opposite where we sat watching through the glass. One screen lists the ‘reference markets’ which for coffee was the New York C price for March deliveries, at 237.5 cents/lb. A ‘change’ value of 0.55 indicated the increase in the unit price since the trading started at 2pm. Another screen listed the type of coffee being traded in each session, and as we arrived they were on Unwashed Local By Product Coffee. The symbol/code for one of the lots on offer was a 3LUBP3 AA, signifying that it was a rather anonymous lot from crop year 2003 by the Ethiopian calendar Local Unwashed By Product quality 3, stored in the Addis Ababa warehouse. 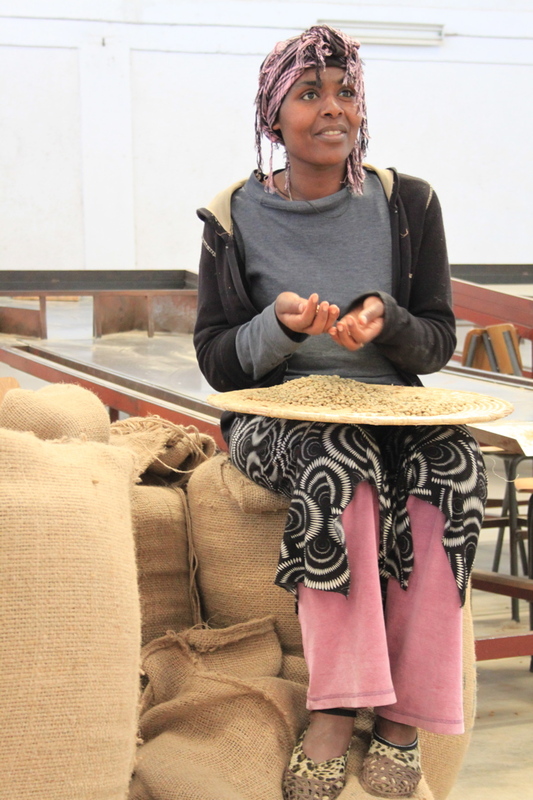 Later on we moved on to some export lots, and one of the first new crop lots I’ve seen, a very early Limu. The code for this was 4WLMA3 JM, meaning 2004 Washed LiMu A grade 3 JiMmah warehouse. Make sense? Also listed next to this was the ‘Last’ price: 1340 which is what this type of coffee closed at yesterday, and the ‘Range’ set for trading today: 1340 +/- 5%, so 1273-1407. I haven’t fully done the maths and confirmed it but I believe that the 1340 is birr per farsula, which is 17 kgs. Bare with me, I’ll double check this asap. So with the offers and price ranges listed the sellers of the lots on screen gather in the sunken octagon with any interested buyers. While there could be just one seller and one buyer there is usually several of each, and often more of one than the other. If you are a seller you wear a green coat, if you’re buying for the local market you wear a blue one, and if you’re buying for export you’re in khaki- all jackets printed with identifying numbers on the back- sort of like football shirts! At the sound of a bell 10 minutes to complete business starts on the clock. Pace, alertness and skill is of the essence, as negotiations between the parties may start slow but finish quick, and it seemed fascinatingly chaotic to me as an onlooker. There is much shouting, shaking of heads, uninterested glances and cheeky grins to see as they walk around each other fishing to see who might bite. The body language is great to watch, from the ‘I don’t need your money’ glare to the corresponding ‘I don’t need your coffee’ pose. But if a sale is close, the seller and buyer will both raise a hand and if they agree, they’ll do a little high-five to seal the deal and I find myself cheering them on in my head to get to that high-five before the end of the 10 minutes. Sometimes nothing got sold, sometimes one buyer would high-five 3 sellers in quick succession in the very last seconds. The parties then approach a window where they fill in each their slip of paper identifying them by their personal coat numbers, coffee and price details and pass them to the clerk for entering into the computer. The clerk checks that the buyer has enough money deposited to complete the purchase, approves it, and the bank transaction immediately sets the money in movement to the sellers account. They have the security of knowing that with this system, the money will pretty much be in their possession at 2pm in trade+1 day, while buyers need to plan their budget for possibly being out of pocket on a coffee for up to 3 months before they sell it on and get paid by buyers and roasters in importing countries. A nice surprise was to see Haileselassie knocking on the glass and waiving to us, wearing his khaki coat ready to buy some beans. He wasn’t too happy with the prices he got offered so no luck today, but I was lucky and got a quick photo with him- safely off the floor so the guards didn’t confiscate the camera! The second stop of the day was the offices of Ambasa, where we had the pleasure of meeting with the wonderfully charming chairman Mr. Geoffrey Wetherell, who came to Ethiopia for the first time during the war in 1941 and liked it so much he returned with his wife 6 years later and set up a coffee business. General Manager Degu Assefa took us to the cupping room to present to us some of the coffees they have been working with in the last year, and again the grade 2 Yirga Cheffe, even this late in its season, reminded me of how much I miss the bergamoty yirgs that seem so few and far in between these days. Also a Q grader, Dagem felt that while he trusts in the judgement of the graders of the EXC he wondered if they were sometimes too strict, as finding coffees graded as ‘1’s is becoming harder and increasingly rare. When it comes to shipping, these small quantities of grade 1’s are sadly often blended in with grade 2’s in order to fill the container with something that can be sold as Grade 2 and still specialty- but which really is an average of the higher and lower end of that spectrum. A whirlwind tour of the warehouse before they shut for the day showed me how much history is in this company, beautifully maintained old stone and wood buildings, vintage equipment preserved next to more modern versions and archives of museum-worthy items documenting decades in the Ethiopian coffee industry. Slightly further out of town Ambasa do have a newer warehouse that opens in the peak season to take some of the load off the old facility, a massive state of the art building where Pinhalense machines were poised and ready for the busy season to start in a couple of months. Site manager Conor will then be in charge of a huge crew, so I told him to enjoy the calm before the storm and to go tend to the coffee tree in the courtyard whenever he tires of the chattering of the 250 women needed just to handsort the already near perfect coffee in a final clean before export! Tomorrow I head south again and will probably be offline for a week, so lucky you- no more longwinded post for a bit!